As we eagerly watch our new elementary school rise out of the ground off of State Route 795 and see crews prepare the downtown campus we are developing a plan to utilize our temporary Rossford High School and Rossford Junior High School spaces. As you know, Rossford High School will be housed at Owens Community College, and Rossford Junior High School students will occupy Indian Hills. This will be for the upcoming school year, and first semester of the 2019-2020 school year with our new downtown campus anticipated opening in January 2020. With sending about half of our students to new locations, we are in the midst of finalizing new transportation plans. We are aiming for the safest and most efficient transportation plans for our students. Routes and times will be available in August by downloading the new app. The routes will also continue to be published in the Rossford Record before the school year begins. To help us plan and organize our new routes, please visit log onto your PowerSchool account and update your student’s information for this year. There is a new transportation question included that will help us plan routes. We are asking that these are completed by August 1. Our new transportation plans will have RJHS/RHS students in most of the district (downtown excluded see further plans below) picked up on one bus. Buses in the morning will drop off high school students at Owens first, then go to Indian Hills to drop off junior high students. In the afternoon the buses will pick up at Owens Community College then our junior high students at Indian Hills before returning students to their homes. Some high school students will have to change buses at Indian Hills before being returned home. For Downtown Rossford students there will be a route that will only pick up high school students and take them directly to Owens, followed by a bus that picks up only junior high school students at the same stops and take those students directly to Indian Hills. Those stops will be at Beech Street and Glenwood Road; at Eagle Point Road and Hannum Avenue, Jennings Road, and Colony Road; and off State Route 65 at Bacon Street, Osborn Street, Rossway Avenue, Vineyard Drive, and Rossburn Place. A map of these stops is attached. Downtown students will be picked up at the stop closest to their homes. 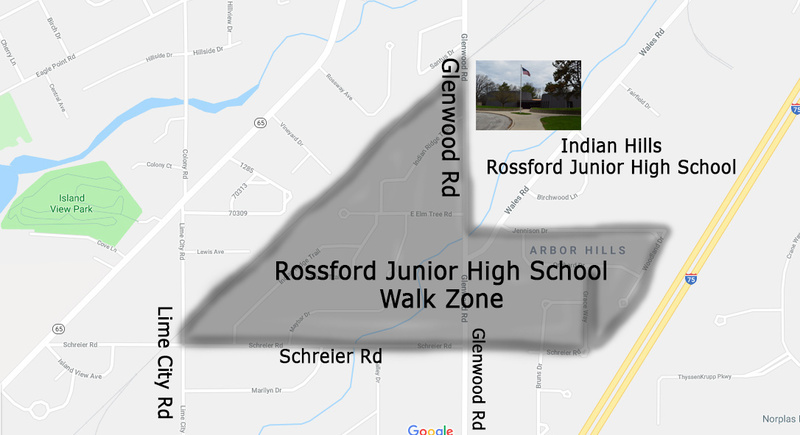 The junior high school “Indian Hills” walk zone is marked in the attached image. Students will not cross railroad tracks to walk to school. Arbor Hills and parts of Bruns Drive will be included in the walk zone. - A bus will now be dedicated solely for Penta Career Center students. - Alternate drop off and pick-up locations are subject to availability. New forms must be submitted each year; they are due by August 1. - We are developing a transportation app for smartphones that will allow us to communicate alerts directly to parent-guardians. Look for additional information on downloading the app when it is available in August. - Pick-up times may vary a few minutes within the first two weeks of school due to a change in ridership, we appreciate your patience. If you have any questions, please contact our Transportation Department. Staff can be reached at 419-666-8695 and Transportation Supervisor Julie Kalisik can be reached at 419-360-3283. If they are not available, please leave a message and your call will be returned as soon as possible.